Note: I am pleased to say that this post is now quite dated. Google Translate includes Frisian and there is no longer any need to use Dutch as a go-between on that site. I now recommend Taalweb Frysk for when you need additional detail or a word is missing. Also, the University of Groningen currently has an excellent free online Frisian course for English-speakers. If you are seriously interested in West Frisian, I'll share some study techniques that have worked for me. 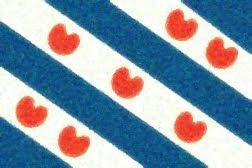 I often use an online dictionary available at http://www.wurdboek.nl/ to go between Frisian and Dutch (click on the second button, FRL-NL, to select Frisian to Dutch), then translate the Dutch into English with Google Translate. You'll even get sample sentences, which can be extremely helpful. Glosbe has just about the best online Frisian/English dictionary I have found so far, but it is very incomplete. It has sample sentences as well. Glosbe is wonderful when it has the word you need, but it is also missing some very fundamental vocabulary. You can't count on it for everything. You may want to buy used editions of Rod Jellema's translated books of West Frisian poetry (I bought my copies off Amazon). These can be highly useful to English-speakers who are seriously interested in the Frisian language. Omrop Fryslân's main page lists occasional articles that are also available in Dutch (these have a Netherlands flag icon next to them). Again, you can run the Dutch version through Google Translate or another translation service if you are starting out. It's not perfect, but it's better than nothing.